Water constitutes about 71 per cent of our planet and 60 per cent of our body. We can survive without it barely for a few days. And yet we indiscriminately deplete it, knowingly contaminate it, and unfortunately pollute it, with or without anticipating the devastating consequences of its crisis. Water is one of the most important natural resources and most of the things that we consume everyday requires it in significant proportions. There is an interdependence between water and energy generation. From generating power from fossil fuels, pumping out crude oil from the ground, and mining coal, to cooling down power plants and cleansing the pollutants generated from fossil fuels, water plays a crucial role in power generation with conventional energy. The flaw with conventional energy with respect to water conservation lies in the fact that it not only utilizes water in greater amounts, it also contaminates the water bodies with the waste it creates continually. Taking into consideration the large number of oil, coal and other conventional energy power plants that exist, it is daunting to even imagine the implications of the constant damage that we are inflicting upon the water supply. The dire state when clean water becomes a rare commodity seems not too far. An ideal source of energy generation, therefore, is one that uses the least amount of water to generate high energy. The Sun is an infinite source of energy. It generates eco-friendly power and saves natural resources, including one of the most important one i.e. water. 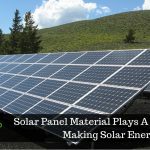 Let us throw some light on certain factors that make solar energy solution save substantial amount of water while generating tremendous power. The conversion of solar fuel (sunlight) into electricity requires almost no water. Even after the power generation process, the solar power plant requires no water for cooling. To generate a unit of electricity, solar panels use almost 1/200th of the water used by any other conventional resource energy generation plant. The production of solar panels requires some amount of water. It, however, is comparatively quite less as compared to other traditional power generation methods. 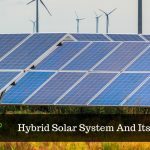 The dependence on water becomes even lesser since the solar panels are manufactured in a sustainable manner that can be recycled further to minimize the dependence on water. If we compare powering a car with gasoline or any other bio-fuel, solar panels use considerably less amount of water to power electric cars. The extraction and processing of oil utilizes a great amount of water whereas solar panels, as we have already seen, require diminutive amount of water for its production and energy generation. Photovoltaics or floating solar farms cover a large part of water bodies, like lakes and ponds. In addition, to generate power, they reduce the rate of evaporation and maintain the water levels in the fresh waterbodies unreduced. Water is one of the most important natural resources that is literally indispensable to our existence. Conventional power generation has been depleting clean water at a rapid pace jeopardizing our present and future. An acceptance towards solar energy, in its long list of benefits also accommodates saving water, which has significant implications for our healthy existence and bright future. SaveGeo Energy Pvt. 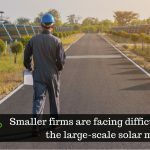 Ltd. is one of the fastest growing solar EPC solutions providers powering residential, commercial, and industrial infrastructures with clean solar energy. Keeping into consideration the quality aspect of each process and activity, we strive to realize your dreams of going solar and ensure a long, prosperous life for your solar plant.